Significantly stronger than other dental solutions, dental implants offer a single and permanent solution to a lost tooth. 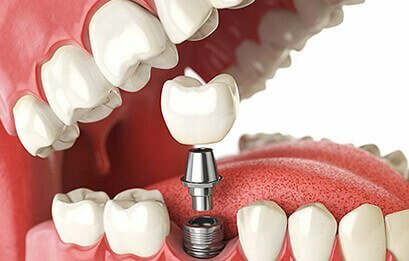 Dental implants can also serve as anchor teeth, from one implant to another, to form bridges and thus replace the gap left by multiple missing teeth. Dental implants are inserted into the jaw with small titanium screws. It is only over the course of several months that these naturally bond to the mouth. Our dental implant specialists have trained in the US and are board certified specialist in implants. They have a 97% success rate, and will give a lifetime guarantee on all implants. Dental implants can restore your smile, helping you feel better about yourself.